DETROIT (Bloomberg) -- General Motors Co. will probably seek to raise $8 billion to $10 billion in an initial public offering in November, a smaller sale than the automaker originally targeted, said two people familiar with the matter. The U.S. Treasury Department, which owns 61 percent of GM, is more interested in fetching a higher share price to eventually recoup its $49.5 billion investment than in cashing out a bigger portion of its position, said the people who asked not to be identified because the discussions are private. A larger deal at a lower price would place more pressure on the government to win higher prices in future offerings, the people said today. GM and its investment banks have been considering a deal as large as $16 billion, people familiar with the plans said in August. Chairman Ed Whitacre, who handed CEO duties to Dan Akerson on Sept. 1, had favored an IPO that would sell as much of the government's position as possible, the people said. GM's banks also sought a larger deal because it would generate higher fees. Noreen Pratscher, a spokeswoman for GM, and a Treasury spokesman, Mark Paustenbach, declined to comment. The department could offer as little as $6 billion in shares, though that is unlikely because the government and GM want investors to have more shares available for trading, the people said. Later offerings will be used to sell bigger portions of the government's position, the people said. The size and price of the IPO is fluid and market conditions could change the offering significantly, the people said. GM will split the stock to a price around $20 a share as is routine in many IPOs, one of the people said. China's SAIC Motor Corp., which runs a joint venture with GM in Shanghai, is likely to buy a stake of 1 percent or less, the two people said. SAIC would buy the shares to show support and firm up ties with GM. The Treasury Department wouldn't be willing to sell the company more shares, the people said. GM said the government will own some common stock after its initial public offering, without specifying the number of shares or percentage of stock outstanding. The company added the disclosure today in a re-filing of its S-1, the prospectus companies submit to register shares they want to sell. GM said the Treasury will have the ability to “exert control, through its power to vote for the election” of directors as a result of owning some of GM's common stock. As a government entity, Treasury's interests “may differ from those of our other stockholders,” GM said in the filing. 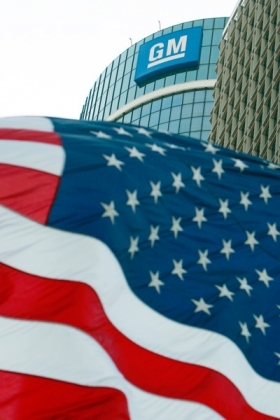 A $10 billion share sale by GM would be the biggest U.S. IPO since Visa Inc.'s $19.6 billion raised in March 2008. The offering would be the third-largest all-time in the U.S., also trailing AT&T Wireless Group's $10.6 billion offering in 2000. GM shares must be sold at an average of $133.78, before splits, if the U.S. is to recoup its investment, Neil Barofsky, the special inspector general for the Troubled Asset Relief Program, said in a letter to U.S. Sen. Charles Grassley, R-Iowa. Including dividends and interest GM already has paid the government, the stock must sell for $131 before splitting for the U.S. to break even, said one of the people familiar with the situation. Whitacre, who remains chairman through the end of the year, said during an automotive conference in August he was eager for the U.S. to sell its shares because it would boost employee morale and help GM sell more vehicles. “We don't like this label of Government Motors,” said Whitacre, 68.